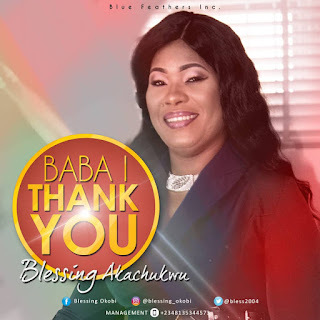 North Carolina based gospel Minister and Pastor, Blessing Akachukwu premieres a send forth praise single titled 'Baba I Thank You'. The power praise tune 'Baba I Thank You' is a melody showdown released off the amazing sophomore album 'Hand Of God' premiered recently. Her vocal prowess in this set tune insinuates an elliptical and tempo rhythm in her clause of resorbing ideal gospel contents. In 'Baba I Thank You', the Gospel minister dips deep to recommend to us what should be our heart when God do things which amazes us - hence this masterpiece 'Baba I Thank You'. Catch up the glimpse of this African praise tune and revive your Thanksgiving style. More still coming from Blessing Akachukwu. Born as an indigene of Edo state but raised in Lagos State, the Gospel phenomenal moved on to the United States with her husband where the call for ministry took charge. Her debut album 'HAND OF GOD' released lately has a full package of God's promises to His children. She and her husband are pastors of Redeemed Christian Church of God located at North Carolina. They are blessed with wonderful children.